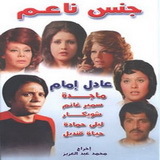 Video Description : Girls is Egyptian film produed in 1977, directed by Mohamed Abdel-Aziz and the author Zargani. Events revolve around three young men who sell themselves . Rich women seek young people an opportunity to revitalize their lives.